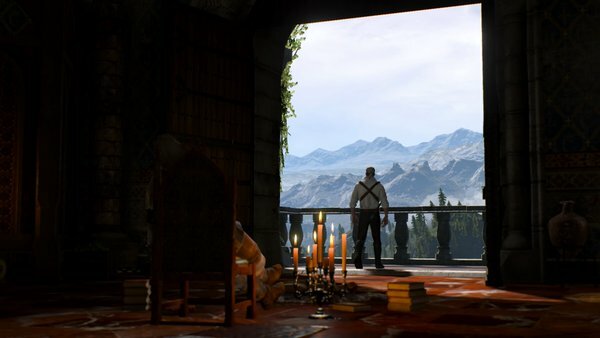 - Do as the game instructs once you gain control of Geralt and pull up your Witcher Senses. This will allow you to observe conspicuous stuff in the immediate vicinity. The only thing worth looking at is a Key sitting on a book near the room’s locked door. Use it to open the door. - Head to the lower level for a cut scene. Once you’ve been introduced to Ciri you’ll get the chance to do some wall running against her. She’s fairly slow, so beating her to the end isn’t too difficult, though you should still watch out for long falls. There are a few places where it’s easy to accidentally kill yourself. Winning or losing doesn’t make much of a difference. - You’ll hit a cut scene at the bottom whether you won or lost, and gain the opportunity to train with your sword. Vesemir, Geralt’s fellow Witcher, will take you step-by-step through the rudiments of combat. Some of the finer points are less important on the easier difficulties, but if you want to play the game at its hardest it’s best to learn this stuff now. Sheathe your sword once Vesemir declares open season to stop fighting, or keep it out to practice for as long as you like. - Cut scene follows, as well as a number of questions you may or may not answer. Once it’s done you’ll be headed straight into combat against a pack of Ghouls - as well as another quest, Lilac and Gooseberries.